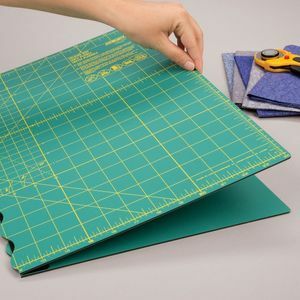 Olfa 17" X 24" Folding Cutting Mat. Durable cutting surface. Mat absorbs cuts made by both rotary cutters and art knives (straight utility knife blades). Mat folds flat for easy portability. When flat, fold-line becomes almost invisible. Wavy fold line creates a smooth, gapless surface when laid flat (won't skip threads when cutting directly over fold). Green back w/o grid lines on FCM-17"x24". 2.5mm thickness. FCM-17x24 - Size when open: 17.75 x 24.5; Size when folded: 17.75 x 12.375.